↑ १.० १.१ The Associated Press (1997-07-12). "Pakistani girl shot by Taliban able to stand, doctors say". Canadian Broadcasting Corporation. http://www.cbc.ca/news/world/story/2012/10/19/malala-yousufzai-hospital-united-kingdom.html. अन्तिम पहुँच तिथि: 2012-10-19. ↑ Memmot, Mark (9 अक्टोबर 2012). "Talibadiaryn Say They Shot Teenaged Pakistani Girl Who Exposed Their Cruelty". NPR. http://www.npr.org/blogs/thetwo-way/2012/10/09/162573135/taliban-say-they-shot-14-year-old-pakistani-girl-who-exposed-their-cruelty. अन्तिम पहुँच तिथि: 15 अक्टोबर 2012. ↑ ४.० ४.१ "Diary of a Pakistani schoolgirl". BBC News. १९ जनवरी २००९. http://news.bbc.co.uk/2/hi/south_asia/7834402.stm. ↑ "Pakistani girl, 13, praised for blog under Taliban". BBC News. 24 Nov. 2011. http://www.bbc.co.uk/news/world-asia-15879282. ↑ "Swat girl falls short of getting world peace prize". PakTribune. 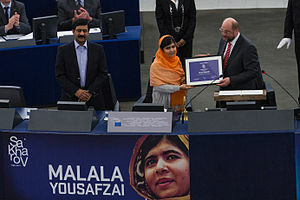 24 Nov. 2011. http://paktribune.com/news/Swat-girl-falls-short-of-getting-world-peace-prize-245347.html.